EXTREMELY FINE. THIS UNIQUE PLATE NUMBER BLOCK OF THE FAMOUS 1918 24-CENT INVERTED "JENNY" IS CONSIDERED BY MANY TO BE THE MOST VALUABLE ITEM IN UNITED STATES PHILATELY AND ONE OF THE MOST VALUABLE PHILATELIC ITEMS IN THE WORLD. Discovered and acquired by William T. Robey at the New York Avenue post office in Washington D.C. on May 14, 1918. Ex Edward H. R. Green, Amos Eno, B. D. Phillips and the Weill Brothers of New Orleans. Featured in the "Aristocrats of Philately" exhibits at Anphilex 1971 (New York City) and Interphil 1976 (Philadelphia). With 1989 P.F. certificate. 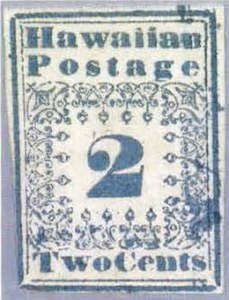 THE ONLY KNOWN COVER BEARING THE HAWAIIAN 2-CENT MISSIONARY AND THE ONLY INTACT COVER WITH TWO DIFFERENT DENOMINATIONS OF HAWAIIAN MISSIONARY STAMPS. THE RAREST AND MOST FAMOUS OF ALL HAWAIIAN AND UNITED STATES COVERS, AND UNIVERSALLY RANKED AMONG THE WORLD’S MOST IMPORTANT PHILATELIC ITEMS. Exhibited among “The Aristocrats of Philately” at Anphilex 1971 (New York City), Interphil 1976 (Philadelphia) and Anphilex 1996 (New York City). Shown by invitation in the Courts of Honor of 15 international philatelic exhibitions (last displayed at Washington 2006) and illustrated in the exhibition catalogues for London 1980 and World Stamp Expo 1989. Displayed in the “Gems of Hawaii: The Persis Collection” exhibit at the Smithsonian National Postal Museum in celebration of the museum’s first anniversary. Pictured on the United States Postal Service 2002 souvenir sheet designed by Richard Sheaff (Scott 3694). Illustrated in Rare Stamps, L. N. and M. Williams; Encyclopedia of Rare and Famous Stamps, L. N. Williams; described and illustrated in Meyer-Harris Hawaii, Its Stamps and Postal History, and Gregory Hawaii Foreign Mails to 1870 (Figure 15-28 and pictured on the front cover of Volume I); featured in Life magazine’s “The World's Greatest Stamps” (May 3, 1954) and on the cover of Esquire magazine (October 1956). Ex George H. Worthington (pencil “3/11/05 New Eng. S. Co. ISSS SS”), Alfred F. Lichtenstein, Alfred H. Caspary, Benjamin D. Phillips, Alfred J. Ostheimer III, Honolulu Advertiser (Thurston Twigg-Smith/Persis Corporation) and Guido Craveri/Tito Giamporcaro. THE CELEBRATED AND UNIQUE "PACK STRIP" -- ALSO KNOWN AS THE XIPHOPAGUS TRIPLET -- WIDELY ESTEEMED AS ONE OF THE TOP TEN PHILATELIC RARITIES IN THE WORLD. Ex Lindgren, Martins, Lemaire, Pack, Souren, Contini, Dias and Lima. Exhibited in Interphil 1976 and Anphilex 1996 Aristocrats of Philately displays. Illustrated in Life magazine's "World's Rarest Stamps" feature story and color spread (July 1954) and in Encyclopedia of Rare and Famous Stamps, L. N. Williams. 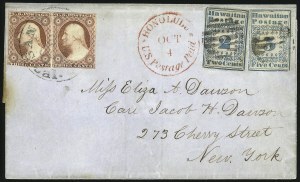 On this cover the Missionary stamps prepay the 5c Hawaiian postage and 2c ship captain's fee, and the pair of United States 3c stamps prepays the 6c trans-continental rate in effect at this time. The 2c Missionary cover does not bear a year-dated marking, but can be reliably dated to 1852. The sender, William Dawson, sailed from San Francisco to the Hawaiian Islands on the schooner Samuel Roberts, which departed on March 10, 1851. His first letter from Hawaii (see Part 2, lot 2073) was written from Lahaina on April 19, 1851, in which he remarks, "I have cast my anchor on this Island & settled down in peace after having been tossed on the timultuous Waves of Life for Thousands of Miles & have come to the end of my journey. Thus, his correspondence with family and friends back home begins in April 1851. Another Missionary cover from the Dawson find is dated February 20, 1852 (see lot 29). Further evidence of 1852 usage is provided by the United States stamps and the San Francisco postmark. 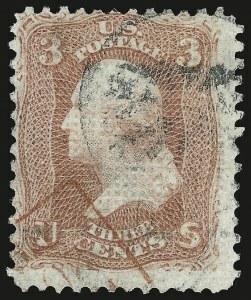 The 3c pair comes from Plate 2 Late, which is known used as early as January 1852, and the Brownish Carmine shade and impression are typical of the 1852 printings and in stark contrast to the Rose Red shades circulating in 1854. The San Francisco circular datestamp, having a wide font and the letters "Cal." in upper and lower case, came into use in 1849 and is found on covers through early 1853, but no later. The final factor in determining the year-date is the sailing schedule. The Mary A. Jones sailed from Honolulu on October 5, 1852, the day after the postmark was applied, and arrived in San Francisco on October 26, a voyage of 21 days. An interesting comparison can be made between the 2c Missionary cover and two other Missionary covers carried on the same voyage (see lot 5 and Census No. 2-I-COV-70, Appendix I). In the case of the 2c mixed-franking cover - a very early use of U.S. stamps from Hawaii - the San Francisco post office felt compelled to cancel the United States stamps immediately after unpacking the mail, and they used the "Cal." device dated October 27. In the case of the other two covers, which had no U.S. stamps (one fully prepaid by a 13c Missionary, the other with U.S. postage due), there was no such compulsion. 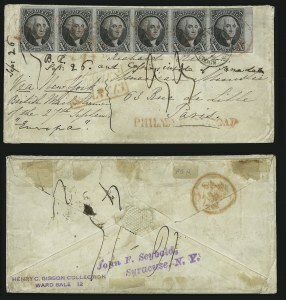 Those two letters were held for the regular processing of mail bound for the East Coast via Panama on November 1 and were postmarked with the "CAL" style of San Francisco datestamp. This famous 2c cover, which has been included in every list of the world's most outstanding philatelic items, often as Number One in terms of rarity, quality and usage, has a fascinating provenance that is detailed in Alvin Good's The Life and Adventures of a Philatelist (pages 81-82). According to Good's account, during the summer of 1905 a defunct tannery in Bridgeport, Connecticut (reported in other accounts to have been Newark, New Jersey, or New Bedford, Massachusetts), was being cleaned for conversion to a Morocco factory. Some 35 years earlier the building had been abandoned, and, in feeding old papers and records into the furnace before leaving, the previous occupants had choked out the fire, leaving bundles of half-burned papers in the stove's belly. The workman now given the job of cleaning out the boiler and furnace knew something about stamps and became intrigued by the presence of old stamps on folded letters and envelopes scattered among the charred papers. When he noticed the partially burned envelope with a strip of three 13c Missionaries (see lot 29), he dug deeper and found the folded cover bearing the 2c Missionary. Fortunately for philately, this letter escaped an incendiary fate, showing nothing more than a faint spot at left where the lettersheet was licked by the flames. The Dawson Missionary covers were sold soon after their discovery to or through New England Stamp Company. The firm featured the 2c cover on their season's greetings card of 1905-06 as "The Rarest Cover Known to Philately." It was acquired by George H. Worthington, the Cleveland chicle magnate and the leading American collector of the time, for a price reported to be $6,000. Alvin Good, the source of the 2c Missionary cover's provenance, was Worthington's philatelic secretary. A pencil note on the back indicates that the cover was purchased by Worthington in March 1905. The entire Worthington collection was acquired privately in 1917 by Alfred F. Lichtenstein, who retained some portions of the collection and sold others through a series of auctions in 1917-18. Lichtenstein and another major collector of the time, Alfred H. Caspary, are said to have had an informal truce whereby they avoided concentrating on the same philatelic subjects. Therefore, while Lichtenstein formed his own fine, but relatively modest, collection of Hawaii, the 2c cover was released, giving Caspary the opportunity to acquire it for his formidable collection of Hawaiian classics. When the Caspary collection was sold by H. R. Harmer in October 1957, the 2c Missionary cover was purchased by Raymond H. Weill Co. for $25,000 - a phenomenal price that was 2-1/2 times the realization for the Alexandria "Blue Boy" postmaster's provisional cover in an earlier Caspary sale. The Weills retained the cover in stock briefly, until a collector, Mr. P., acquired it for his stellar United States collection. In 1969 the Weills purchased the Dawson cover along with Mr. P.'s entire holdings for $4.07 million, but it was not long before Alfred J. Ostheimer III made the cover his most significant single acquisition and the cornerstone of his Hawaii collection. After The Honolulu Advertiser purchased the Ostheimer collection in 1970, the 2c Missionary cover was absent from the market during the quarter-century when important covers climbed in value. Thus, what has been described as "the most valuable and interesting of any early nineteenth century cover" (Alvin Good) and "by far the most important item in Hawaiian philately [and] one of the greatest covers in the world" (Dr. Norman S. Hubbard, "Aristocrats of Philately", Interphil `76 Catalogue, p. 79), will be offered at auction for the first time in 38 years. Exhibited among "The Aristocrats of Philately" at Anphilex 1971 (New York City) and Interphil 1976 (Philadelphia). Shown by invitation in the Courts of Honor of fourteen international philatelic exhibitions and illustrated in the exhibition catalogues for London 1980 and World Stamp Expo 1989. Displayed in the "Gems of Hawaii: The Persis Collection" exhibit at the Smithsonian's National Postal Museum in celebration of the museum's first anniversary. Illustrated in Rare Stamps, L. N. and M. Williams (p. 27); Encyclopedia of Rare and Famous Stamps, L. N. Williams (p. 129); described and illustrated in Hawaii, Its Stamps and Postal History, Meyer-Harris (p. 30 and 113); featured in Life magazine's "The World's Greatest Stamps" (May 3, 1954) and on the cover of Esquire magazine (October 1956). Ex George H. Worthington, Alfred F. Lichtenstein, Alfred H. Caspary, Mr. P. Collection, Alfred J. Ostheimer III. ABRAHAM LINCOLN. 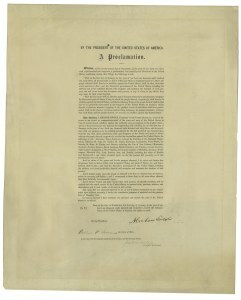 Document Signed as President, “Authorized Edition” of the Emancipation Proclamation, co-signed by William Seward as Secretary of State, and John Nicolay as Private Secretary to the President. Washington, D.C., January 1, 1863 [but printed and signed 1864]. one page, 17-1/4x 21-3/4 inches, J. Whatman watermarked paper. President Abraham Lincoln issued the Emancipation Proclamation on January 1, 1863. With this Executive Order, he took a decisive stand on the most contentious issue in American history, redefined the Union’s goals and strategy, and sounded the death knell for slavery. The text of his proclamation reveals the major issues of the Civil War: slave labor as a Confederate resource; slavery as a central war issue; the status of African Americans who escaped to Union lines; courting border states; Constitutional and popular constraints on emancipation; hopes of reunion; questions of Northern acceptance of black soldiers; and America’s place in a world moving toward abolition. The President took the action, “sincerely believed to be an act of justice,” knowing that it might cost him the election. Of only 48 copies signed by Lincoln, 26 are known to survive; nearly all are in (or are expected to be donated to) institutions. Condition. Large, bold Abraham Lincoln signature. The signatures of William Seward and John Nicolay are fine, but as is typical, lighter than the President’s. Conservator’s condition report available on request. Provenance. Private collection since at least the 1960s. VERY FINE. A STRIP OF SIX IS THE LARGEST MULTIPLE OF THE 10-CENT 1847 ISSUE KNOWN ON COVER. ONLY TWO COVERS ARE RECORDED, THIS BEING SIGNIFICANTLY MORE IMPORTANT AS AN 1848 RETALIATORY RATE USAGE. IN THE 1944 GIBSON SALE CATALOGUE, PHILIP H. WARD JR. DESCRIBED THIS REMARKABLE ARTIFACT OF POSTAL HISTORY AS "THE MOST IMPORTANT COVER KNOWN TO AMERICAN PHILATELY." Ex Seybold, Gibson, Rust and Kapiloff. EXTREMELY FINE GEM. THIS MAGNIFICENT EXAMPLE OF THE 1918 24-CENT INVERTED JENNY IS GRADED XF-SUPERB 95 BY PROFESSIONAL STAMP EXPERTS. THIS STAMP HAS ALWAYS BEEN REGARDED AS ONE OF THE FINEST FROM THE ORIGINAL DISCOVERY SHEET OF 100. IT IS THE ONLY INVERTED JENNY TO HAVE MET THE RIGOROUS STANDARDS FOR THE XF-SUPERB 95 GRADE. 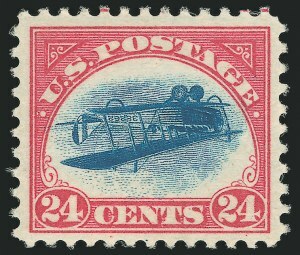 The original sheet of one hundred Inverted Jenny errors was purchased by William T. Robey on 14 May 1918, the first day the stamps went on sale in all three principal airmail route cities: Washington, D.C., New York and Philadelphia. Robey bought the sheet for its $24 face value at the New York Avenue Post Office window in the District of Columbia. Soon after, the sheet was sold to Colonel Edward H. R. Green through Eugene Klein, a Philadelphia stamp dealer. Green paid $20,000 for Robey’s sheet, then instructed Klein to divide it into singles and blocks, and to sell all but a few key position blocks. It is possible to reconstruct the Inverted Jenny sheet with photographs of the singles and blocks (see the reconstruction on page 62). Based on centering alone, most would grade 70 or 75. Only a few stamps could possibly qualify for a Professional Stamp Experts (P.S.E.) grade of VF 80 or better. In our opinion, the centering of the stamp to the right of this one--Position 59--should qualify it for XF-Superb 95, but no others could achieve 95 (or better). 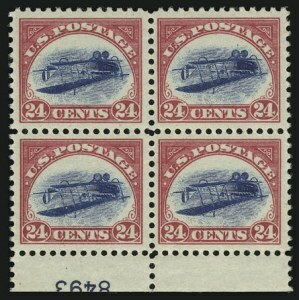 Condition is another factor limiting the grade potential of Inverted Jenny stamps. Despite their great rarity and value, many of the original hundred have been mistreated by collectors over the years. Colonel Green himself allowed moisture to affect some of the stamps he retained. Eight straight-edge copies that Klein was unable to sell and returned to Colonel Green were found in Green’s estate stuck together in an envelope (they were soaked and lost their gum). Other examples have become slightly toned from improper storage and climatic conditions. 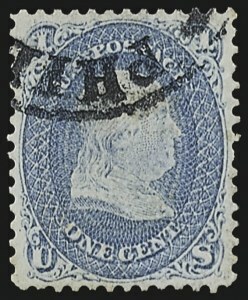 Hinge removal has caused thins and creases in numerous stamps, and one was physically Scotch-taped to an exhibit page. A couple still remain unphotographed, and one was nearly lost to philately forever when it was swept up in a vacuum cleaner. Finally, with the discovery of a third stamp from the stolen McCoy block--recognized by The Philatelic Foundation’s expert staff when it was submitted by an auction firm--only one purloined Inverted Jenny remains at large. The stamp offered here, Position 58, is remarkable for its pristine state of preservation and for its centering. It was originally the lower right stamp in a block of four, comprising Positions 47-48/57-58, which was owned by Eugene Klein, the dealer who bought the sheet from Robey. It was inherited by Klein’s daughter, Delores Klein Hertz, who sold it to Robert A. Siegel. Mr. Siegel sold the block to Raymond H. Weill, who placed it with Benjamin D. Phillips in July 1959. The Weills bought the Phillips collection in 1968 for $4.07 million and sold the block to another collector. According to Raymond Weill, he was asked to divide the block into singles for four different heirs. Position 58 was sold to a Mr. Hoover in 1975, who sold it at auction in 1985 to West Coast collector Bruce McNall. Mr. McNall partly paid for it with an exchange for Position 3. 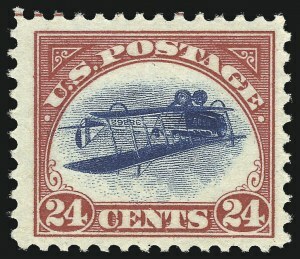 After Robert Zoellner’s first Inverted Jenny fell out of his Scott Platinum album and was sucked up by a vacuum cleaner, he replaced the wounded copy with this stamp, which he purchased in the Superior Stamp & Coin auction of McNall’s collection. In our sale of the Zoellner collection (Sale 804), the stamp realized $192,500 (including the 10% buyer’s premium), selling to a private collector. When our firm was asked to offer it in the 2005 Rarities of the World sale (Sale 895), we obtained a P.S.E. certificate with a grade of XF-Superb 95. The stamp shattered the previous record for a single, realizing $577,500 (including the 10% buyer’s premium). It is now offered on behalf of the buyer. Ex Colonel E. H. R. Green, Eugene Klein, Delores Klein Hertz, B. D. Phillips, Weill (to an anonymous collector), Hoover (according to Weill), McNall, Zoellner (to anonymous collector), anonymous collector to the current owner at Siegel 2005 Rarities of the World sale (Sale 895, lot 374). With 2005 P.S.E. certificate (graded OGph XF-Superb 95; see photo on page 61) and encapsulated since 2005. The next highest grade in the P.S.E. Population Report is VF-XF 85. THIS IS ONE OF THE FOUR 3-CENT B GRILL STAMPS DISCOVERED TOGETHER ON COVER IN 1969, WHICH REMAIN THE ONLY EXAMPLES KNOWN TO PHILATELY. ONE OF THE RAREST STAMPS IN THE WORLD AND A KEY TO A COMPLETE COLLECTION OF UNITED STATES POSTAGE STAMPS. The shade and thinner paper of the 3c B Grill stamps are more typical of the mid-1868 printings and quite different from the paler Rose shades and thick paper of the 1867 and early 1868 3c grilled issues (A, C, D, Z and some E production). The shade and paper indicate that the B Grill was implemented after the 1867 experimental period and after the first two months of regular 1868 grill production. Perhaps the B Grill was created during the process of making a replacement grilling device for one of the two machines. The grilling surface must have worn during production of many thousands of sheets, and it seems likely that replacement grills would become necessary in mid-1868. Through miscalculation or possibly deliberate experimentation, the grill size per stamp on this new B Grill device was twice the width of the F Grill. Based on the small number of surviving copies, this wider grill must have been quickly modified or discarded. Sheets with the B Grill made their way into the regular supply and, in the case of the discovery examples, were used in early 1869. The Scott value for this stamp is roughly based on the realization in the 1998 Zoellner sale held by our firm, where another example brought $155,000 hammer. A decade later, the escalation in demand and prices for major philatelic rarities should make the Scott value irrelevant. With photo of 1969 P.F. certificate for cover and 2008 P.F. certificate for this single. EXTREMELY FINE. ONE OF THE BEST-CENTERED AND FRESHEST STAMPS FROM THE ORIGINAL SHEET OF 100. FOR THE COLLECTOR SEEKING THE FINEST QUALITY, THIS STAMP IS THE IDEAL INVERTED "JENNY". The original sheet of 100 was discovered and acquired by William T. Robey at the New York Avenue post office in Washington D.C. on May 14, 1918. This stamp, with Positions 47-48 and 58, at one time comprised a block of four owned by Eugene Klein. After Klein's death in 1944, his daughter, Dolores Klein Hertz, was instructed to claim a sealed container held by a Philadelphia bank in accordance with his Will. Resting on top of the various stamp collections in this container was the block of inverts. The Klein-Hertz block was sold by Mrs. Hertz to Robert A. Siegel, who in turn placed it with Raymond H. Weill Co. The block was later sold by the Weills to a collector, Mr. Phillips, whose philatelic estate they acquired in 1968 for just over $4 million. The Weills received Philatelic Foundation certificate number 10,000 prior to splitting the block into singles at their client's request. This example comes from the position next to the Zoellner copy (Position 58), which realized $525,000 hammer in our 2005 Rarities sale, still a record price for the Inverted "Jenny". Ex Colonel Edward H. R. Green, Eugene Klein, Dolores Klein Hertz, B. D. Phillips and William C. Mack. With 1988 P.F. certificate. EXTREMELY FINE. 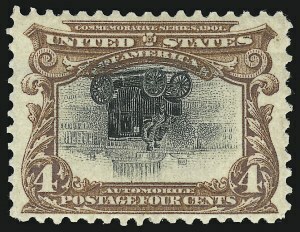 THE ONLY AVAILABLE EXAMPLE OF THE TWO RECORDED 1868 ONE-CENT Z GRILL STAMPS, ONE OF THE WORLD'S GREATEST PHILATELIC RARITIES AND THE KEY TO A COMPLETE COLLECTION OF UNITED STATES STAMPS. The timeline on page 144 narrows production of the 1c, 10c and 15c Z Grill stamps to a period in 1868 between February 19, when the 10c and 12c E Grills went into production, and February 28, when the 1c and 2c E Grills were first produced. These dates are extrapolated from earliest known usages and official Stamp Agent records of grilled stamps delivered (see page 145). The quantity of 1c grilled stamps issued during the first two quarters of 1868 (4.7 million, both E. and Z.) is much greater than the quantities of 10c (1.9 million) and 12c (1.4 million) grilled stamps issued during the same period (mostly E Grills). However, in used condition the 1c E (and Z) Grill is far scarcer than the 10c and 12c E Grills used. This relative scarcity is reflected in the Scott E Grill prices, which value the 10c and 12c unused higher than the 1c unused, but the 1c is valued higher used than either of the 10c and 12c used. The conclusion we draw from the disparity between the relative quantities issued and relative values, used and unused, is that used 1c E (and Z) Grill stamps have a low survival rate. The reason for this low survival rate probably lies in the postal rates that could be paid by one or two 1c stamps. Looking at the rates then current, the largest demand would come from commercial firms mailing printed matter and tax assessors mailing income tax forms in March 1868. This class of mail has an extremely low survival rate for the obvious reason that printed circulars and wrappers are typically thrown out. Printed matter also placed an extra burden on the post office, and, from the covers that survive we have learned that old postmarking devices were sometimes retrieved and used to cancel circulars and wrappers. The Philadelphia 32-millimeter circular datestamp, which was used on first-class mail up through 1866, was evidently brought back into use in early 1868. Another example from the same time period--a genuine 1c E Grill--is recorded in the Philatelic Foundation records (PFC 133477 "Genuine"). The one other recorded example of the 1c Z Grill is photographed, front and back, in the Appendix on page 374. It is part of the New York Public Library collection, which was donated to the library by Benjamin K. Miller during the 1920's. The NYPL's 1c Z Grill and one of the six recorded 10c Z Grill stamps (Census No. 85D-CAN-6) were sold to Miller by Elliott Perry in 1919 from the collection of grilled issues formed by William L. Stevenson, who created the letter classification system used today to describe grills (A, B, C, etc.). In 1913 Stevenson published his observation that characteristics in several stamps did not fit with other grills (A through H), but at this time he had not created the Z Grill classification. A year later he added the Z Grill, giving it a letter designation to indicate he did not know exactly where this grill fit in the scheme of grill production. In the January 1915 Collectors' Journal, Stevenson describes the first 1c Z Grill seen, and, in May 1916 Mekeel's he lists two copies known of the 1c Z Grill--up to that time he had seen only one 10c Z Grill. It is likely that Stevenson's first discovery copy is the one sold to Benjamin K. Miller after Perry bought Stevenson's collection in 1918, and that the second recorded example--the stamp in the Zoellner collection--was discovered by Stevenson in 1915 or 1916 and remained with him until later in life or after he died. It surfaced in 1957 when Lester G. Brookman acquired the stamp from Henry Kuhlmann and Carl Subak, two Chicago stamp dealers who discovered it in a collection (possibly the balance of Stevenson's holding). Perry, the leading expert on grilled issues, authenticated the 1c Z grill, and Brookman, also a grill expert, sold the stamp with confidence to Wilbur Schilling. To ensure its authenticity, the stamp was submitted to the Philatelic Foundation and received certificate 8537. When the Schilling collection was sold in 1975, the 1c Z Grill was offered in our firm's 1975 Rarities of the World sale and realized $42,500 (versus $25,000 current Scott value). In May 1975 it was again certified by the Philatelic Foundation as a genuine "double Z grill, cancelled Philadelphia". In 1977 the stamp was sold at Sotheby's for $90,000, doubling the current Scott value, to Superior Stamp & Coin Company, who in turn sold it to Dr. Jerry Buss of Beverly Hills. When the Buss collection was sold through Superior in 1986, the 1c Z Grill smashed all records, realizing $418,000 (with 10% commission premium) versus $110,000 Scott value. On January 22, 1987, the Philatelic Foundation issued its third "Genuine" certificate, signed by the preeminent philatelic expert, Herbert Bloch. VERY FINE. THE UNIQUE "SET" OF 1861-66 RE-ISSUE BLOCKS OF FOUR, WHICH IS COMPLETE FROM THE ONE-CENT THRU THE 30-CENT (THE 90-CENT DOES NOT EXIST IN BLOCK FORM). SIX OF THESE BLOCKS ARE UNIQUE. THEY WERE HIGHLIGHTS OF THE CASPARY, LILLY AND HETHERINGTON COLLECTIONS, AND AS A GROUP FORM ONE OF THE GREATEST ASSEMBLAGES OF BLOCKS IN CLASSIC UNITED STATES PHILATELY. Stamps from previous issues were made for the 1875 Centennial Exposition in Philadelphia, and were intended both for sale and also to showcase examples of every U.S. stamp printed to date. Stamps which were no longer valid for postage were called Reprints (those with original issue dates prior to demonetization -- Scott Nos. 3, 4 and 40-47). Those still valid for postage were called Re-Issues. Those printed concurrently with contemporary designs were called Special Printings. The Post Office Department tried to get the original printing company to make them where possible; the Continental Bank Note Company printed Scott Nos. 40-47 and also Scott Nos. 167-177 and 180 and 181, while National Bank Note Company printed Nos. 102-111 and Nos. 123-132. The 1861 Re-Issue and 1869 Pictorial Re-Issue were the only set of Reprints, Re-issues or Special Printings to be issued with original gum (both were done by the same printing company). The quality of the printing is very high -- the colors are consistent, the impressions are uniformly superior, and the paper used is thicker and whiter than the original issued stamps. The design and perforations are exactly the same as the issued stamps. Perhaps the quality of the printing was an attempt to showcase their skills, to be considered for future stamp contracts. They were only available from the offices of the Third Assistant Postmaster General, who recorded the quantities purchased and the names of the purchasers. On July 23, 1884 the remaining stock was destroyed, by order of the Postmaster General. Our records for the 1861 Re-Issues are very comprehensive, and encompass hundreds of auction catalogues, as well as the Levi Records. The 3c, 5c, 10c, 12c, 24c and 30c blocks are unique. There are two blocks recorded for the 2c and 15c (the second of the latter with repaired perfs). Ex Caspary, Lilly and Hetherington. The 1c with 1982 P.F. certificate. Others with 1968 P.F. certificates. VERY FINE. 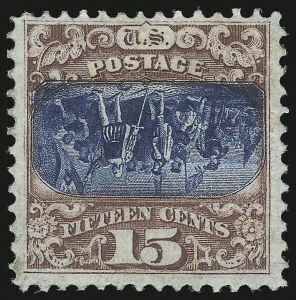 THE FINEST OF THE THREE RECORDED UNUSED 15-CENT 1869 PICTORIAL INVERT STAMPS, AND THE ONLY EXAMPLE KNOWN WITH ORIGINAL GUM. ONE OF THE MOST SIGNIFICANT AND INSTANTLY RECOGNIZABLE RARITIES IN PHILATELY. Exhibited in the Invited Exhibits section of Anphilex 1996 (New York City). Illustrated in Rare Stamps, L. N. and M. Williams; featured in Lifemagazine’s “The World's Greatest Stamps” (May 3, 1954). Ex Paul Lichtenstein (the discoverer), George H. Worthington (possibly from the Frederick W. Ayer collection), Alfred F. Lichtenstein, Arthur Hind, Alfred R. Brigham, Josiah K. Lilly Jr., Benjamin D. Phillips, Ryohei Ishikawa and Steven C. Walske (additional past owners and sale information will be found in the Sale History which follows). Siegel Census No. 119b-OG-01. Certified by The Philatelic Foundation in 1960 and again in 2003 as “Genuine, previously hinged” (certificate 398836, which no longer accompanies stamp). With 2013 P.F. certificate as “Genuine, previously hinged” with a grade of Fine-Very Fine 75. With 2013 Professional Stamp Experts certificate (1270180), which states “genuine unused, o.g., previously hinged” with a grade of Fine 70, Mint OGph. A VALUABLE AND IMPORTANT WORLDWIDE STAMP COLLECTION. This collection in 33 Scott Specialty albums is the result of at least three decades of dedicated collecting by one of those rare individuals who set out to complete the world. Excluding the United States and Possessions, which are not part of this collection, virtually every country is represented for the years stamps were issued up to the mid- 20th century. There are tens of thousands of unused and used stamps carefully mounted with hinges or in hingeless mounts. Hundreds of countries and thousands of completely filled pages are contained in this massive collection, which is offered intact, according to instructions received from the trustee of the deceased collector’s trust. It is impossible to describe every significant item in this collection, but the following overview will convey the “flavor” of the collection, as well as the scope and depth of representation. The Scott Specialty albums are arranged by geopolitical categories, and this overview follows that arrangement. We begin with the two volumes of Great Britain, British Europe and Oceania, in which there is a valuable collection of Great Britain, including several scarce or rare ten-shilling, one- and five-pound Victoria issues, most of the George V and VI sets complete, a choice unused “V.R.” Official and many of the other scarce Officials. The value of the Great Britain collection alone is in the mid-five figures. In addition to Great Britain there are solid collections of Australasia, including Australian States (an excellent showing of used classic issues, especially New South Wales and New Zealand) and Australia pound-value Kangaroos (mixed used and unused). Noteworthy scarce stamps among the Pacific Islands include Fiji Times Express and “VR” overprints, New Britain overprints, North Borneo (including Japanese Occupation), North-West Pacific Islands overprints and an unusually complete collection of Samoa Express stamps. The next volume is dedicated to British America, including Canada and Maritime Provinces, and Caribbean and Latin American colonies. There is substantial value in the Canadian Pence and Large Queens issues, and Newfoundland is the most valuable of the Maritime Provinces. Dominica features the rare 1886 1p on 4p Green (14; SG 18) on piece, a major world rarity. Among the more valuable country collections is Turks Islands, featuring a selection of the scarce or rare surcharged issues. 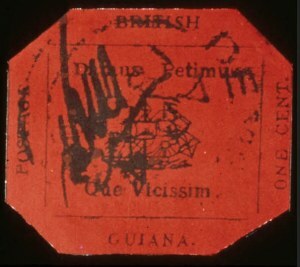 British Guiana boasts two of the typeset provisional issues. Rounding out the British Colonial and Commonwealth countries are two volumes of British Africa and two volumes of British Asia.These albums are packed with complete sets and high-denomination George V and George VI issues, as well as the myriad overprinted issues from stamp-issuing entities in Africa and other colonial outposts. Madagascar is especially strong in Consular issues. The Mafeking Siege is represented by some of the scarcer provisionals. All together, the British Africa is a formidable collection worth six figures on its own. The British Asia collection is a bit lighter in the more valuable issues, but its total value is still in the mid-five figures, with Ceylon, India and Malaya dominating. Next we come to the vast collection of Europe and European Colonies, contained in seventeen volumes, many of which are bulging with filled pages. Naturally, France and Germany dominate, with the classic issues well-represented and German States featuring a Saxony First Issue. Italian States are surprisingly complete and in excellent condition, including a choice Savoy Cross on piece. The undisputed highlight of the collection will be found in Switzerland, where a sound and Very Fine Double Geneva is located (with von der Weid certificate). This rare gem is a $20,000-$30,000 item and would satisfy the most discriminating collector. The volumes containing Scandinavia-Finland (one), Latin West Indies (one), Central and South America (five) will impress the viewer with their completeness and many scarce issues. Two volumes of Independent Countries of Asia have most of the value concentrated in China, where a 5c Large Dragon Wide Spacing and Red Revenues light up the pages. There is also a separate collection of People’s Republic of China contained in two three-ring notebooks, which is worth several thousand dollars (it contains the Year of the Monkey stamp). Regarding condition, this is most definitely not a “spacefiller” collection. The better stamps in this collection are at least Fine and more often Very Fine. It contains stamps that were bought at auction and from dealers at significant percentages of catalogue value. 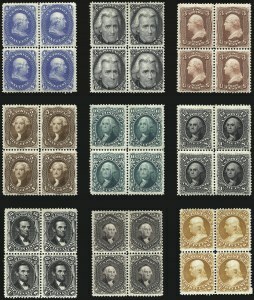 Some of the sets are mixed unused and used, and minor faults in some of the classic issues should be expected, but sound Very Fine stamps with catalogue values in excess of $500.00 will be found throughout. There are a large number of expert certificates, and we detected very few problematic stamps. Our conservative estimate is based on the fair market value of the stamps if they were offered in typical individual lots and small country collections. The estimate does not reflect the extraordinary opportunity to acquire a worldwide collection of this vast scope and depth in one lot. Filling page after page with the sets and scarce issues found in this collection took decades and, if attempted incrementally, would take an equal amount of time. For someone who loves stamps -- the entire world of stamps -- and wants a “turn-key” worldwide collection on which to build, this is a unique opportunity. Needless to say, for a dealer with the means to make a substantial investment, its acquisition within, or even above, our estimate range holds certain potential for a substantial resale profit. Special presale registration will be required in order to bid on lot 3946. This lot will only be released to the winning bidder after payment in full in cleared funds has been made. Prospective bidders who wish to examine lot 3946 must make an appointment for viewing. REGISTRATION/APPROVAL/PAYMENT: To register and receive approval for bidding on lot 3946, please contact Colleen Stellato at Siegel Auction Galleries by telephone at 212-753-6421 or email colleen@siegelauctions.com. Prospective bidders on lot 3946, even if known to our firm, must allow at least three full business days for approval. References (trade and personal) may be required. The Siegel firm reserves the right to require a deposit prior to bidding or to refuse bids from anyone whom Siegel, in its absolute discretion, does not deem to be a bona fide bidder for lot 3946, even if the bidder has been approved by Siegel or Stamp Auction Network to bid on other lots. The successful purchaser of lot 3946 must make arrangements for payment in cleared funds (including sales tax or customs duty) within ten business days of the sale. Delivery charges, if any, will be invoiced separately and must be paid before delivery. VIEWING: Viewing of lot 3946 will be by appointment only under Siegel’s close supervision. To schedule an appointment, please contact Andrew Titley at Siegel Auction Galleries by telephone at 212-753-6421 or email andrew@siegelauctions.com. Prospective viewers should allow at least two hours to examine the entire lot. Siegel reserves the right to rotate viewers during a viewing session. IN ADDITION TO THE ABOVE NOTICE, ALL CONDITIONS OF SALE WILL BE APPLICABLE TO THE OFFERING OF LOT 3946. VERY FINE-EXTREMELY FINE. THIS IS THE ONLY RECORDED BLOCK OF THE 1857 5-CENT BRICK RED IN UNUSED CONDITION, WITH OR WITHOUT ORIGINAL GUM. AN IMPORTANT UNITED STATES CLASSIC BLOCK RARITY -- REGARDED TO BE THE MOST IMPORTANT PERFORATED 5-CENT JEFFERSON ISSUE MULTIPLE -- AND EVEN MORE REMARKABLE CONSIDERING THE GREAT RARITY OF THE 5-CENT BRICK RED AS A SINGLE STAMP WITH ORIGINAL GUM. This is the only intact block of the 5c Brick Red. 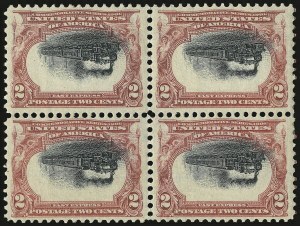 The Caspary collection contained a block of three with a fourth stamp added to create a complete block. Neither Ryohei Ishikawa nor William H. Gross were able to secure the 5c Brick Red original-gum block for their fabulous Grand Prix award-winning collections. Apart from the block offered here, there are perhaps twenty 5c Brick Red stamps with original gum to be found among major auction sales of the past fifty years. About half of the known examples are poorly centered. Almost two-thirds have stains or small faults. Judging from our survey, we estimate that perhaps six or seven sound original-gum Brick Red stamps exist with centering approaching any of the stamps in this block. The three sound stamps in this block would probably fetch $100,000 to $150,000 each if offered as singles. The Scott U.S. Specialized Catalogue values a single at $80,000.00, yet the unique block carries a mere $55,000.00 premium (17%). Many collectors know this issue by type and shade, but fewer are aware of the order of production (or release). This state of confusion is partly due to the Scott Catalogue. The distinctive Brick Red shade of the 5c 1857 Issue comes first in the series of Scott-listed perforated 5c issues, but its true release date comes later in the sequence. Based on dated covers, the 5c Type I shades were released in the following order: 1) Red Brown, Scott 28, EDU 8/23/1857; 2) Indian Red, Scott 28A, EDU 3/31/1858; 3) Brick Red, Scott 27, EDU 10/6/1858; 4) Brown, Scott 29, EDU 3/21/1859, almost certainly the last printing from the first 5c plate. The second 5c plate was made from a new six-relief transfer roll with the design projections cut away at top and bottom, to varying degrees. The Type II Brown was issued first (Scott 30A, EDU 5/4/1860), and the Orange Brown printing from the same plate followed about one year later (Scott 30, EDU 5/8/1861). 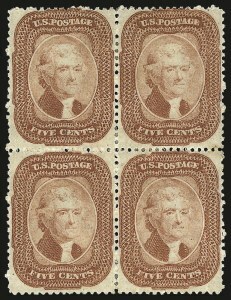 The first 5c sheets to be perforated in mid-1857 undoubtedly came from the unissued supply of 5c imperforate sheets in the "1856" Red Brown shade. These are akin to 1c perforated stamps from Plate 1 Late (Type IV, Scott 23) and Plate 2, and 3c perforated stamps from the Type I plate (Scott 25). Covers dated during the second half of 1857 and first quarter of 1858 have 5c stamps in the "1856" shade of Red Brown, which look like Scott 12 with perforations. By March 31, 1858, the EDU of the Indian Red shade, a second printing must have been made. We suspect that the entire family of Red Brown, Bright Red Brown and Indian Red shades -- all of which differ from the "1856" Red Brown -- were printed at the same time during the first quarter of 1858. No one has established a separate EDU for an "1858" Red Brown (Scott 28) -- separated from the earlier perforated "1856" Red Brown, which has the same Scott number -- thus our hypothesis cannot yet be supported by an EDU. If we are correct, the "1858" Red Brown and Indian Red should have similar EDU dates. The Brick Red EDU of October 6, 1858, and its predominant use in early 1859 indicate either a separate printing (3rd Quarter 1858) or a later release date for stamps printed earlier. The Brick Red color is so far removed from any of the other 5c shades, we strongly suspect it was made inadvertently while the printers tried to match the earlier 1856 Red Brown. The Brick Red shade is actually closer to some of the 3c 1851 shades than it is to the 5c 1856. Sheets of the irregular 5c shades (Brick Red) would have been added to the stacks along with the subsequent Red Brown, Bright Red Brown and Indian Red sheets. However, when stamps were issued to post offices, the "color corrected" sheets would be released before the "irregular" Brick Red sheets were distributed. Looking at the EDU's, there is a largely consistent pattern of new 5c printings at the beginning of each year in 1858 (Red Brown), 1859 (Brown), 1860 (Type II Brown) and 1861 (Type II Orange Brown). The only exceptions to this pattern are the "1856" Red Brown perforated sheets released in mid-1857, which make sense in the context of the first perforated issue, and the October 1858 Brick Red. The Brick Red stamps are much too scarce and limited in their distribution (New Orleans and a few other scattered post offices) to constitute a separate printing in 1858. In our opinion, it makes more sense if they were printed as part of the 1st Quarter 1858 printing, but released later in the year when needed. EXTREMELY FINE GEM. THIS STAMP, WITH ITS SUPERB CENTERING, BRIGHT FRESH COLOR AND PRISTINE ORIGINAL GUM, IS THE HIGHEST-GRADED EXAMPLE OF THE 4-CENT PAN-AMERICAN INVERT. BY FAR THE RAREST OF THE PAN-AMERICAN INVERTS IN CHOICE SOUND CONDITION. The 4c Pan-American Invert was a special printing and not regularly issued. Examples were distributed through two official channels, and the gum on the majority of stamps without "Specimen" overprint was disturbed. In fact, because the stamps were removed from mounting paper, they are generally thinned or have seriously disturbed gum. The example offered here, with near-perfect centering and in pristine condition, is a rare exception. Anyone who has attempted to form a superb set of the three Pan-American Inverts knows that the difficulty of acquisition increases exponentially from the 1c to the 4c denominations. In fact, the 4c Invert stamps in almost every "Superb" collection have been compromise copies, acquired out of frustration and desperation after staring at the last remaining blank space for too long. In our opinion, the stamp offered here could set a record not only for the 4c Invert, but for any of the Pan-American Inverts. The 4c Invert with plate number, offered in our Odeneal sale (Sale 941) with a P.S.E. grade of 80, realized $300,000 hammer. Prospective bidders should use the Odeneal realization as a benchmark for the value of the stamp offered here, which is two grade levels higher. Ex Clifford C. Cole. With 1947 A.P.S., 1988 P.F. and 2008 P.S.E. certificates (XF 90). SMQ does not even price this stamp above the grade of 80. SMQ $300,000.00 as 80, which is two full grades below this. VERY FINE. A REMARKABLY FRESH AND CHOICE EXAMPLE OF THE FAMOUS 1918 24-CENT INVERTED "JENNY." THIS STAMP HAS BEEN IN THE POSSESSION OF THE FRELINGHUYSEN FAMILY FOR MOST OF ITS EXISTENCE. 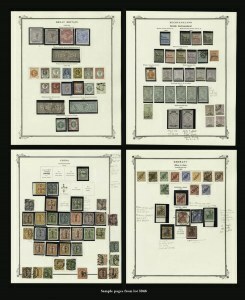 According to Jenny by George Amick (Amos Press, 1986), the original sheet of 100 Inverted "Jenny" stamps was purchased for $24 by William T. Robey at the New York Avenue Branch Post Office window in Washington D.C., on May 14, 1918, one day after the stamp was first placed on sale at the main post office. On May 20, Robey sold his sheet for $15,000 to Eugene Klein, a Philadelphia stamp dealer. Klein had already arranged to sell the sheet to Col. Edward H. R. Green for $20,000. Colonel Green instructed Klein to divide the Inverted "Jenny" sheet into singles and blocks, and to sell all but a few key position blocks. This stamp, Position 74, was owned by former U.S. Senator Joseph S. Frelinghuysen (1869-1948), a second cousin of Peter H. B. Frelinghuysen Jr. Senator Joseph Frelinghuysen sold the stamp at auction through George B. Sloane on December 14, 1932, and the successful bid of $2,750 was made by a "Mrs. F" of Morristown N.J., the mother of Peter H. B. Frelinghuysen Jr. At the time of the Sloane sale the stamp was still Mint N.H., and the price paid was a record. 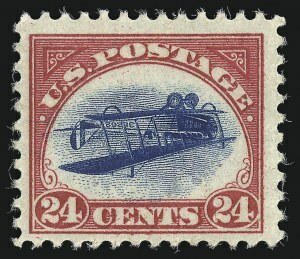 The Inverted "Jenny" was the centerpiece of 18-year old Peter H. B. Frelinghuysen Jr.'s exhibit of worldwide air post stamps at the February 1934 National Stamp Exhibition held at Rockefeller center in New York City. The teenage philatelist won a gold medal, and Stamps magazine remarked, "All the great rarities were included." This stamp has remained with the Frelinghuysen family until now, and it is offered to the market for the first time since 1932. Among the known Inverted "Jenny" examples, this stamp has the longest continuous ownership. It is well-known among stamp specialists and professionals that examples of the Inverted "Jenny" come in different grades of freshness and condition. Many of the original 100 stamps were mistreated by collectors during the years, despite the stamps' rarity and value. Colonel Green himself allowed moisture to affect some of the stamps he retained. Other examples have become slightly toned from improper storage and climatic conditions. Hinge removal has caused thins and creases in numerous stamps, and at least seven have been "lost" to philately -- or nearly so, as in the case of the copy swept up in a vacuum cleaner. This example is notable for its pristine state of preservation, fresh colors and barely-hinged gum. This remarkable stamp appeared in the first sale of the Count Philippe de la Renotiere von Ferrary collection, held at the Hotel Drouot in Paris on June 23, 1921, under the supervision of M. G. Gilbert. In the sale this stamp was described "probablement le plus bel exemplaire qui existe de ce timbre" ("probably the most beautiful example of this stamp that exists"); the describer mistook the printer's ink on back for a light blue cancel, an error of judgment that was repeated in the Meyer-Harris book (p. 112). The 2c Missionary was purchased in the Ferrary sale by Maurice Burrus, an Alsatian tobacco magnate, for the U.S. dollar equivalent of $14,700 - the highest price ever paid for a single stamp at that time. By comparison, in subsequent Ferrary sales the Swedish 1857 3-skilling banco Yellow color error was sold for $3,095, the Baden 1851 9-kreuzer Blue-Green color error on cover sold for $8,087, and an unused Mauritius 1847 1-penny "Post Office" realized $9,733. In the Ferrary sale, the reality about this 2c Missionary stamp - that it is an unused example - was apparently obvious to the bidders and to its buyer, Maurice Burrus. When the stamp was featured in Life magazine's "World's Rarest Stamps" (May 3, 1954), courtesy of Burrus, it was clearly identified as unused and valued at $20,000. The massive Burrus collection was dispersed after his death in numerous auctions in the 1960s, and the Hawaii was sold by H. R. Harmer of New York on May 27, 1963. At that sale the unused 2c Missionary - its unused condition confirmed by a 1963 Philatelic Foundation certificate - soared to the world-record price of $41,000. The successful bidders, Raymond and Roger Weill, wrote at the time of the acquisition, "[The stamp] was one of the two or three sound copies of an extremely rare stamp, unique in unused condition, intriguing through ancestry, issued by an American postmaster for what is now the 50th state in the union, and almost certain to realize a record price for single stamp." The record sale was reported extensively in the news media, but nowhere so imaginatively as in Life magazine (November 29, 1963), which devoted a full page in color to proclaim, "This, pound for pound, is the most valuable substance on earth." Weighing in at a mere one two-thousandths of an ounce, troy, its value was calculated at $1,195,833,395.61 per pound. The unused 2c Missionary was placed by the Weills in the collection of the anonymous Mr. P., where it joined the unique 2c Missionary cover. After acquiring Mr. P.'s collection in 1969, these two stellar rarities were acquired by Alfred J. Ostheimer III. There is a story associated with the early history of this stamp that has been reported as fact by several philatelic authors, but disputed as fiction by others. Prior to Ferrary's ownership, the stamp is said to have been owned by a Parisian collector named Gaston Leroux. The story continues that Leroux was murdered by an envious philatelic colleague, who coveted the 2c Missionary and later confessed to killing Leroux to obtain it. The Missionary earned fame in another murder-mystery story when the motion picture Charade was released, casting the fabled Hawaiian stamp in a starring role with Cary Grant and Audrey Hepburn (we will not tell the ending). Described and illustrated in Stamps of Fame, L. N. and M. Williams (pages 96-97, plate 15). EXTREMELY FINE. THE FINEST OF THE SEVEN RECORDED UNUSED 30-CENT 1869 PICTORIAL INVERT STAMPS, AND THE ONLY EXAMPLE KNOWN WITH ORIGINAL GUM. A MAGNIFICENT STAMP THAT IS PERFECTLY MATCHED WITH THE 15-CENT 1869 INVERT OFFERED IN THIS SALE, BOTH OF WHICH WERE AMONG GEORGE H. WORTHINGTON’S MOST PRIZED PHILATELIC POSSESSIONS. Exhibited in the Invited Exhibits section of Anphilex 1996 (New York City). Described and illustrated shortly after its reemergence and sale at Christie’s NY (Chronicle 151, August 1991). Ex George H. Worthington (possibly from the Frederick W. Ayer collection), Alfred F. Lichtenstein and Steven C. Walske (see the following Sale History for additional past owners and sale information). Siegel Census No. 121b-POG-07. Certified by The Philatelic Foundation in 1990 as “Genuine, with traces of gum” (certificate 232679, which no longer accompanies stamp). With 2013 P.F. certificate as “Genuine, with traces of original gum” with a grade of Very Fine-Extremely Fine 85. With 2013 Professional Stamp Experts certificate (1270179), which states “genuine unused, small part o.g.” with a grade of Very Fine-Extremely Fine 85, Mint POG. 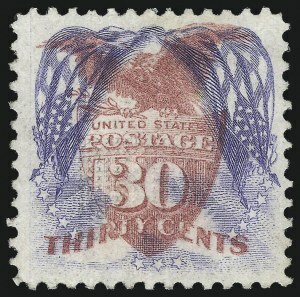 The Stamp Market Quarterly values the 30c Invert in VF-XF 85 No Gum grade at $660,000, but does not list a value for this Part Original Gum stamp.